Gilbane works with students to create a sustainability center with a big impact! The collaboration behind the sustainability center was an unusual one that involved campus leadership, the CSU Institute for Sustainability, student groups, architects and community stakeholders. The vision was to become the focal point for the university and surrounding community’s environmental programs. 39 students participated in the programming phase of building the center. This collaboration was so successful that is has become a point of inspiration for Gilbane’s work in the Higher Education market sector. 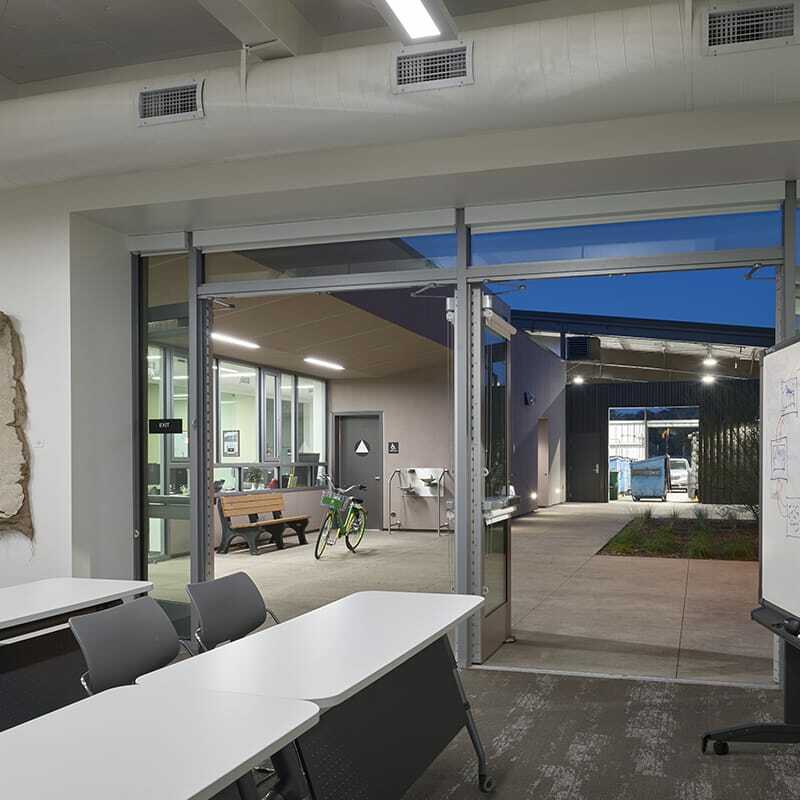 Gilbane provided construction management at-risk services for California State University’s new Associated Students Sustainability Center. The facility is home to the Institute for Sustainability and is intended to serve as an example of energy efficiency and sustainable design. The project features a seminar room, a conference room, student workspace, a lounge, a community resource center, restrooms and a 5,000 SF covered courtyard which will both house equipment for recycling and serve as the rooftop structure for a 25kw photovoltaic system with approximately 100 solar panels. The building envelope is high performance, including glazing systems, enhanced insulation, durable and sustainable cladding, cool or green roof systems, and daylighting throughout the complex. The landscape is drought tolerant and includes a bioswale. 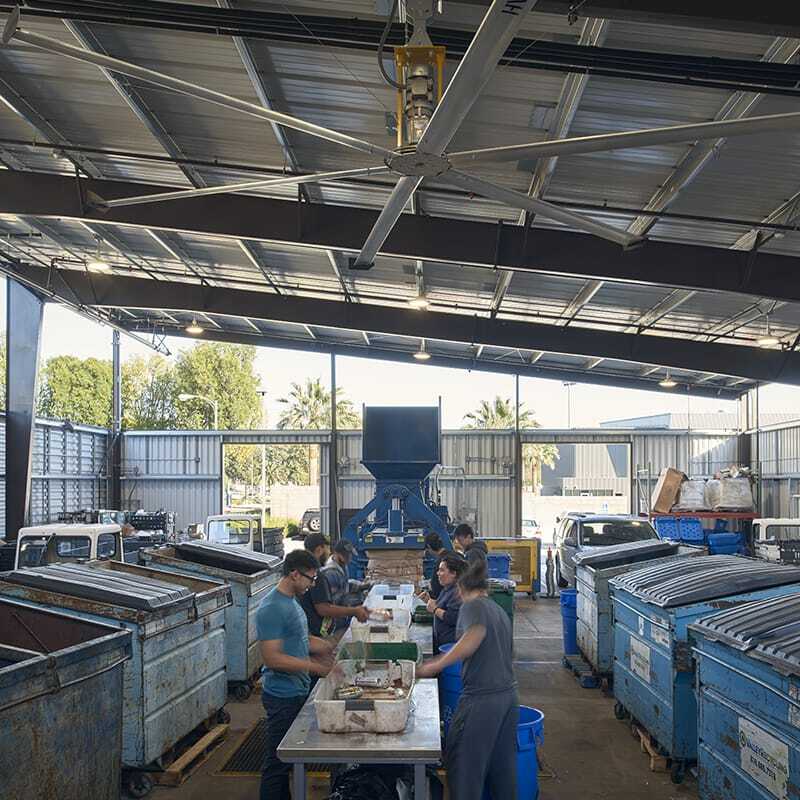 A graywater system connected to onsite showers and lavatories is being used for irrigation; a solar thermal hot water system and vacuum composting toilets have also been incorporated into the project. 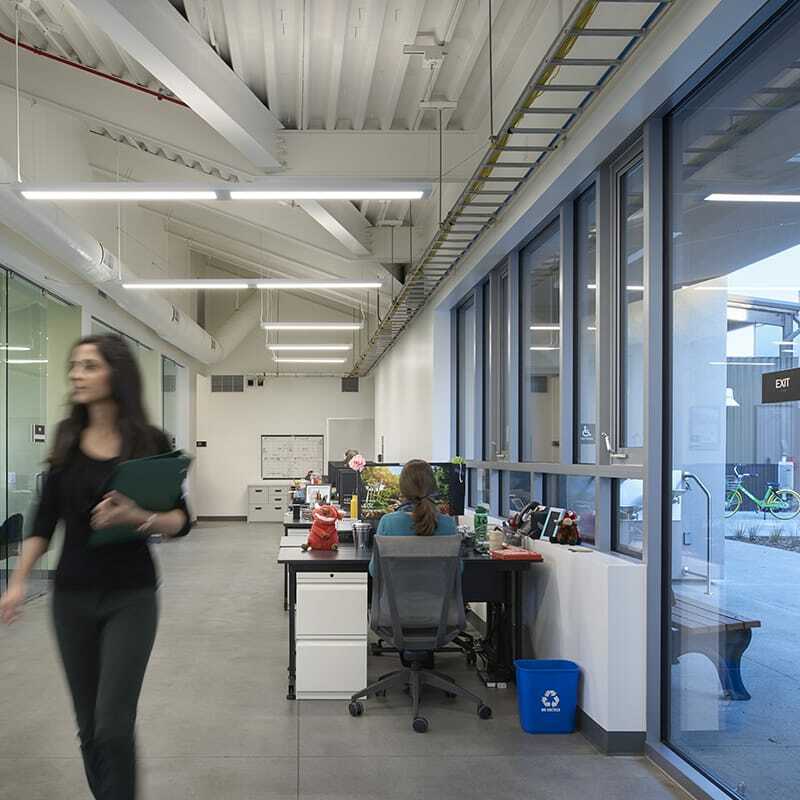 The Center has achieved LEED Platinum certification and is targeting Living Building Challenge certification; and is also seeking both Net-Zero Energy and Net-Zero Water certifications. 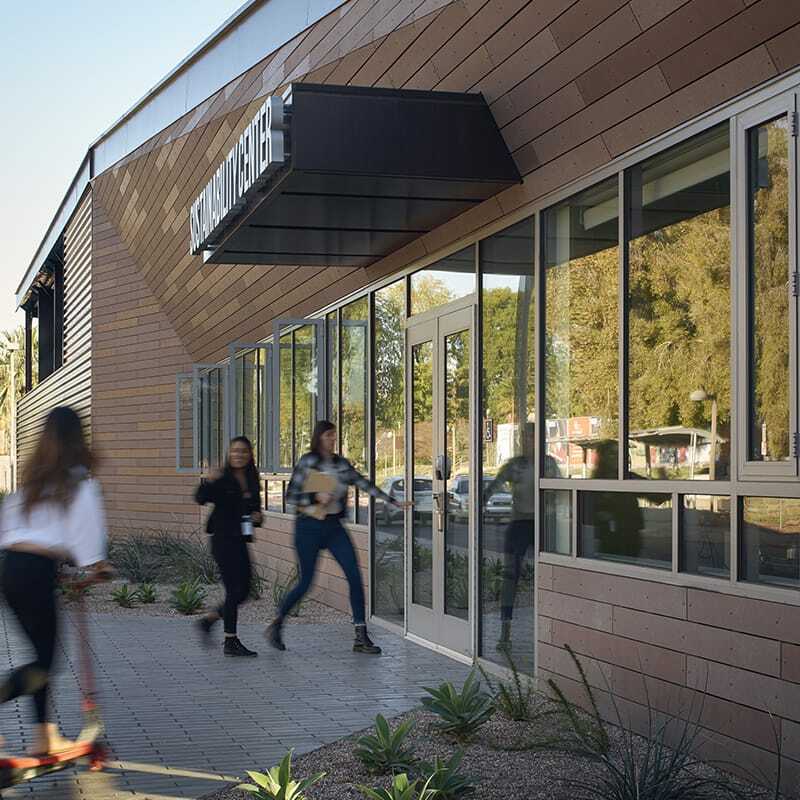 California State University Northridge’s goal was to have their Associated Students Sustainability Center not only certified as LEED Platinum, but to also conform to the Living Building Challenge. After performing a solar site analysis, it was determined that the amount of Photovoltaic (P/V) panels which could fit on the roof size of the building was not adequate to power all the building systems, so an alternate solution was required. Gilbane worked with the electrical subcontractor to determine the efficiency and design of a solar water heating system that could capture enough of the sun’s energy reaching the building site in order to overcome this problem. A solar water heater is one of the most effective ways of cutting a structure’s carbon footprint by reducing reliance on dirty fossil fuel usage. By offsetting the use of electricity, gas or heating oil, using this solar water heater will also provide financial savings to the client by reducing their energy costs. The combination of rooftop P/V panels and the two-tank solar water heating system has ensured the Sustainability Center will generate enough power to run all of the building’s systems.